I’ve been known to get behind In-N-Out burgers, the occasional Subway sandwich or some Chick-fil-a every now and then. And as a child, I definitely would beg my parents to take me to the golden arches, partially so I could play in those grubby jungle gyms, but mostly for the collectable toys. But I fear I am slowly becoming one of those people. By those I mean the ones that turn up their nose at fast food. It wasn’t until yesterday that I realized how unappetizing processed food has inadvertently become to me. I had just climbed onto the metro and plopped down on a seat after work, exhausted, slightly sweaty and 100% ready to be home when this smell hit me. Something like old grease, melting plastic and dusty moth balls. I scanned my surroundings for the culprit only to find someone next to me had pulled out a burger. I scanned again, unwilling to realize the truth: yes, this was the source. Burger King. I found myself repulsed as he scarfed down his flattened bun and square patty in about five seconds flat while clutching the oil-stained bag. THAT IS NOT FOOD, my internal voiced screamed. Food simply does not smell like that! At that moment, I was just so happy to be coming home to my dinner. I guess having fewer processed foods in my diet I has really changed my taste buds over the last few years. 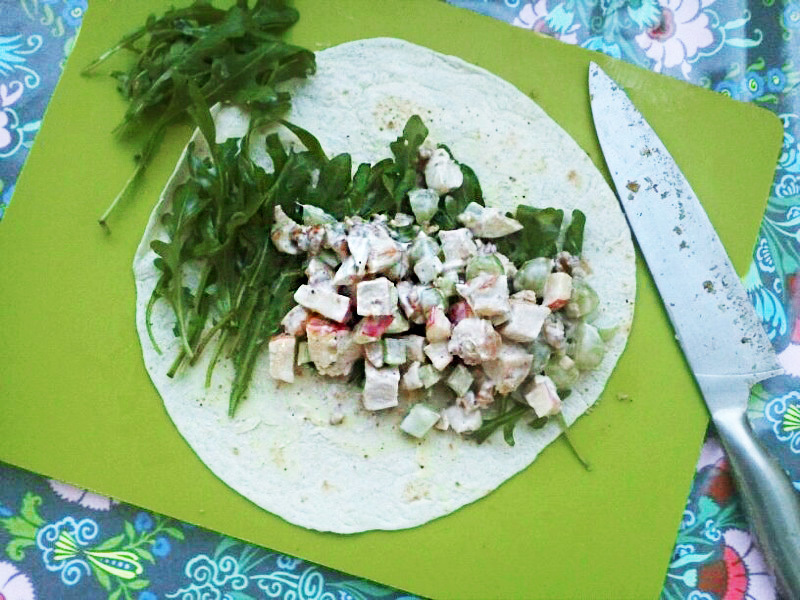 The thought of my Waldorf chicken salad wrap had my mouth watering. After a hot day, it is just so refreshing to chow down on a mix of cold, crisp grapes, crunchy celery and sweet apples. And after eating real food, you just feel so much better. No bloating, no sluggishness followed by immediate hungry. It replenishing body’s nutrients instead of giving your liver toxic junk to process. So do yourself a favor and eat something real. Serves 4. | Total Time: 30 mins. 1. Season the chicken breast with salt and pepper. 2. In a medium nonstick pan on medium heat, pour in olive oil and cook chicken on each side until through. If they are particularly thick, place lid on pan to speed up the process. Remove from pan and allow chicken to cool. 3. Add walnuts into the same pan, turn down to medium-low heat and toast them (takes approx. 4 minutes), stirring regularly to prevent burning. 4. Chop walnuts and add to a large bowl along with the celery, apples and grapes. Once the chicken has cooled, cube it and add it to the bowl as well. 5. In a small bowl, whisk together yogurt, mayo, lemon juice, mustard and salt and pepper. Pour dressing over salad and toss. If your salad is too dry, add more yogurt and lemon juice. 6. Take tortillas, spread with mayo and mustard (optional), lay down arugula in the center, scoop in salad and wrap together like a burrito. Secure with toothpicks or foil.